Review: TomTom Spark 3 – Heart Rate, GPS, Fitness and Music – but nothing more! In an age where most watches are aiming to give some level of ‘smart’ to their uses, TomTom has taken a different approach. The Spark 3, which depending on which model you go for, can offer GPS, Heart Rate monitoring and the ability to stream music to a pair of Bluetooth Headphones. All this is done independent of any phone connection, or need for one. Having said that, this is where the watch draws the line. There are no notifications from the phone, and no ability to respond to them. In fact, the watch hardly ever speaks to the phone, and for all intents and purposes, doesn’t ever need to. Click here for more on similar devices. The Spark 3 comes in the following configurations and prices. As such, the features vary depending on what you pay. The version we reviewed was the Spark 3 Cardio Plus Music, that retails for £219.00. The cheapest of the lot is Spark 3, which retails for only £119.99. For most, this would be adequate, and covers most of the watch’s features. A lot of people would like to add the heart rate monitor, which is an extra 50 quid. However, if you just want a music player in your watch, the cost only jumps by £30 from the base price. Adding those two should be an extra £80, right? No. Space is a premium and hence you pay an extra £100 for them all in one package. Of course, pay a bit more and you also get TomTom’s own headphones. The watch does work with pretty much any Bluetooth headset though, so you don’t need to restrict it to a TomTom one. 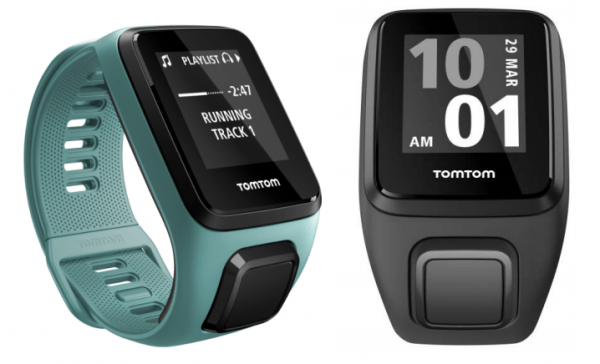 In many ways the TomTom Spark 3 looks like a fairly standard fitness watch. The Heart Rate monitor means it is a bit thick in the middle, and features an E-Ink display. The display itself is crisp and looks great under all light conditions. There is no standard touch screen, though holding two fingers on top of it will turn the light on for a few seconds. Interestingly, this feature also sets itself off if you wear the watch in the shower. Funny how water reacts with touch screens! Below the watch, and embedded into the strap itself is a four way button which can be used to navigate around the various features of the watch. There is no other way to interact with the watch. The strap latches itself in three positions, and is about an inch thick, making sure the watch stays on under all situations. It features good build quality, even though it does look a bit dull and similar to most other products out there. The watch comes with a proprietary USB cable, which fits at the back. This cable not only charges the device, but is also vital in getting started with it. In fact, you need a Windows or Apple computer to get the watch running. I often rely on a Chromebook and there is no way to set this watch up with one of those. Also, these days, you normally expect a phone to be able to do all that. Not for the TomTom Spark 3. In many ways, it is rather old fashioned. You plug the cable onto the watch (slide mechanism), pop it into your computer, and install the software. The watch will take you to the website, and it also shows you a link on the screen itself. Once installed, you can register and setup your watch and account from within the app. The same app on your computer will then get triggered every time you plug it in to charge. In doing so, it will sync the device and update preferences, trails and such like. Once synced, your activity data is available via the TomTom MySports website. The device does come with apps (MySports), but they are not really vital to use this. All you really need is a computer. Once set up, you can view your activities via the app, and browse information such as heart rate, GPS data and sleep data. The Bluetooth connection on the watch is quite temperamental though, and while it did eventually manage to sync through the phone a few times, it was always easier to just plug it in to the computer and let it do its thing. I find this to be an old fashioned approach, which may put people off. The watch also only sticks to fitness, and doesn’t even make an attempt at giving you notifications. I wonder if this is because the Bluetooth connection on the watch doesn’t really work very well with the phone. Mind you, my testing was on an Android, and the performance may be better on an iPhone. Once you’re set to go, the watch will record your activities by default. This will include daily steps and distance travelled. However, if you want to actively log an activity, you need to press ‘right’, choose your activity, wait for the GPS satellites to kick in, and in the words of the watch, Get Going. Sadly, it can take a few minutes for the satellites to locate the watch, and this is when I have been outdoors. 2 to 3 minutes was a pretty typical time, and sometimes it was even more. Once you’re done with your activity, pressing left on the 4 way button lets you pause and then stop the activity. Once the activity is stopped, it is ready to be synced with your MySports account. If you get your phone to do this, well and good. However, connecting it to the PC always worked seemlessly. As far as monitoring went, HR was pretty reliable. I found the step counter to be a bit hit and miss at times, though I find that most watches struggle with that. Of course, once the GPS data kicks in, you’re not really relying on numbers such as steps taken. The highlight feature of the watch was the Trail function. You can either start an activity, and do a ‘Breadcrumb Trail’, which lets you monitor your movement and helps you get back where you started. The alternative is the Preloaded Trail which helps you go from A to B (or a circular route if you want), and shows your progress and route taken in the meanwhile. An arrow shows the direction you’re heading in, and acts as a compass. Trails are also loaded via the computer, and cannot be downloaded on to the watch via the phone. Trails are stored in the watch as GPX files. These can either be exported from runs you have done, or various websites or apps such as MapMyRun can help you download custom GPX files. It has to be remembered that this acts as a guideline, but will not buzz or vibrate if you go off route. Also, it relies on the fact that if you do get lost, you can use this to make your way back as well as you would with a compass. The music feature relies on Bluetooth headsets and music files being on your computer. Once again, this feature cannot be used via your phone. You simply pair a set of Bluetooth headphones to your watch and plug it into your computer. If any of your media programs has PlayLists, it will import those into the device. If not, you will have to create something specially using media players. Sadly, the watch nor the software will help you do that. Once sorted, you can hit UP to play music from the watch, and adjust various settings as per usual. This is a great feature for those who can’t run without music, but don’t want to carry their phones with them either. Sadly, as of now, there is no integration with apps such as Spotify. Being an E Ink screen and minimal Bluetooth runs means this does rather well on the battery life. In fact, in stand by (i.e. just time) mode, it happily ran for two weeks. With activities happening daily, you get a good 5-7 day battery life. Of course, if you are one of those ‘super fit’ people who spends an hour or two running, the time will be less as the watch will spend more time monitoring your Heart Rate as well tracking you via GPS. More information on the TomTom Spark 3 can be found on the TomTom website. It is available from various online retailers, including Amazon, where they have a few discounts going at the moment. For example, the watch I reviewed is going for £40 less than the standard RRP. If you’re expecting another smartwatch with fitness capabilities, you’re looking for the wrong device. This watch delivers one function, and does it well. The reliance on a PC for everything and the Bluetooth connection issues did make it a slightly frustrating experience. Previous story Amazon Go: The Cashier is Going, Going, Gone!